Latest in a long line of musical Schullers, George is one of Boston's (and New York's!) favorite jazz drummers and composers, as well as being the driving force behind the popular little big band Orange Then Blue. For his first recording as leader, George has assembled some of the top players from New England's extensive jazz scene and set them loose on a collection of his own tunes. A stunning, visionary debut from a mature and gifted musician. 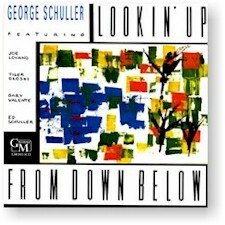 All compositions by George Schuller, except as noted. Recorded on (#1, 3, 7) 15 July 1988 at PBS in Westwood, Massachusetts; (#2, 4, 5, 6, 8) 13 April & 21 December 1986 at Splice of Life in Brighton, Massachusetts.